It goes without saying that when I finally got this thing up and running, I stalked around the house pointing it at things and making the predator noise. While I could go into great detail about how I did this and include step by step instructions, it seems the few people that stumble onto my blog don’t want that sort of thing. So I’ll be keeping it light from now on and only detail anything non standard I do. Without further ado, let’s meet the little guy. Now that’s a tiny camera! See the black square in the circuit board? That’s it. That’s what you got for $400 (Australian Dollars). The rest of that is just a breakout board so you can interface to the tiny pins on the camera without first inventing a shrink ray. 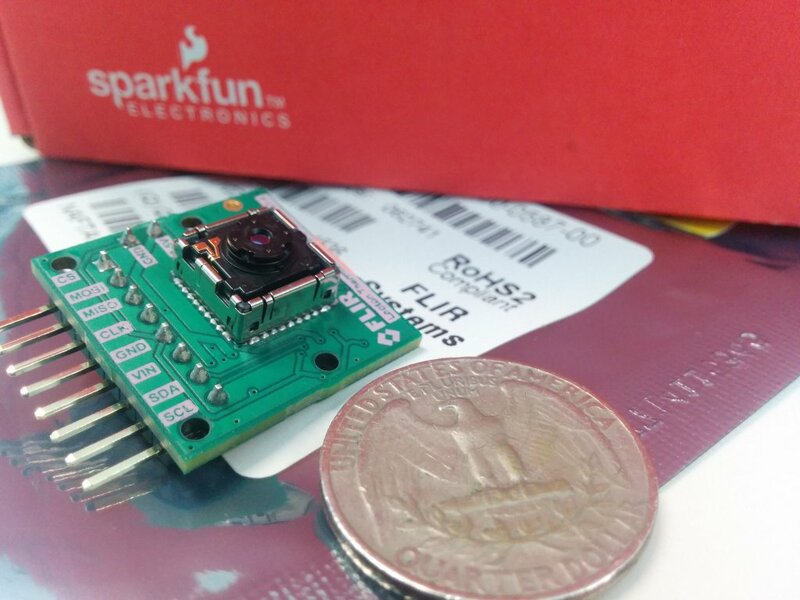 I chose to interface the FLiR to a Raspberry Pi 2 I had laying around. Sparkfun have a tutorial on their website to show you how. It’s super easy and I was done wiring it up in about 60 seconds. Following the instructions for the software install isn’t too bad either. So I did all that it the damn thing didn’t work. I just god a red square in the output video and that was it. A lot of googling and forums with bad advice later lead me to the following tips that should have been made much more clear in the tutorials. If yours isn’t working try the following. USE SHORT CABLES! – Seriously. Like 2-3 inches at most. Worked for me. Don’t break anything. In addition to the default setup, I made a few changes to make it suit my taste a little more. Once that’s changed, you’ll need to recompile the application. Pop open the Pattern.cpp file in the raspberry_video directory. There’s 3 color maps in there that you can fine tune if you like, but for something simple, just write down the names of the colormaps and close that file. Now open LeptonThread.cpp and search for colormap_ironblack. Just change that out for one of the other colormaps you wrote down earlier and recompile the application. When you run the raspberry_video application and the video initialises, point the camera at a part of the room that doesn’t have any hot items in it. Then click the FCC button on the application. This calibrates the unit with the current room temperature and stops it auto adjusting the colors and levels so much. The upside of this is that if you pick up an object in you hot little hands, when you put it down again you can see the handprint left on the object as you transferred some heat to it. Well that’s as far as I got for now. I’ve only had it running for 12 hours and am off to play with it some more. Previous post …But My Robot Says I’m Hot!